I'm not big on donuts or sweets in general but I love me some apple cider donuts. I just read about some spot in Southern Indiana that makes them and now I want some. Is there anywhere in Chicago or in upsate Indiana or Harbor Country (little closer than Southern) that makes these treats this time of the year? The only place I can think of is Wickes Apple Farm in Michigan which is about a 2 hour drive from here. I might be getting to Indiana this fall for a trip with my GF so anywhere that makes really good ones is appreciated. Note: a quick search reveals a few spots but I thought Id give them their own thread for future reference where a list of places could be seen in one topic. I have no idea if she makes them, but if I were looking for cider donuts locally, I'd probably first check with Kirsten of Chicago-based Glazed Donuts. I've had her donuts at Green Grocer and Swim Cafe. I'm not sure if Didier Farms still makes them. Northeast corner of Aptakisic Rd. & Buffalo Grove Rd. A number of the apple orchards also have them. Last edited by Pucca on September 23rd, 2009, 10:23 am, edited 1 time in total. I sometimes get a craving for the ones in Long Grove. Haven't been recently but they sold day old ones (still very good) at a discount. I've tried some others around the area whose makers escape me - one an orchard near Woodstock - but these in Long Grove were hands down the best. Very moist and nicely spiced. Didier farms makes them during their pumpkin patch tourist season and they're damn good. Apple Haus makes them year round. I grew up near Long Grove and my friends and I would sometimes hang out around the back of the Apple Haus, and the staff there would bring us big grease-stained paper plates heaped with piles of the "rejects" (the ones that got broken or didn't fry up in the right shape), still warm from the fryer. Man, did we used to feast on those things. Love'em. Located in Hobart, Indiana, County Line Orchard is the closest U-Pick apple orchard to downtown Chicago. Spending a day at the orchard is one of the best family activities around. Come out and make lasting memories with your children hunting for the "perfect" apple, getting lost in the Corn Maize, or visitng with some farm animals in the Kids Farm. The Barn at County Line Orchard is located at 200 County Line Road, Hobart, IN 46342.
happy-stomach mentions Glazed Donuts. Earlier this summer, I tried a six-pack of mini-donuts purchased at the farmer's market at Uncommon Ground (Devon.) We were not fans. I think one kind was sour cherry and the other was hazelnut-something. We didn't even finish them and baked goods usually have a short life in our house. Maybe her other products are better, but I'm not itching to find out. Old Fashioned Donut, home of single best Apple Fritter in the known universe, makes a killer Apple Cider Donut. Mine was fresh from the fryer and the crisp exterior encasing warm moist apple flavored interior burst with rich apple goodness. The Goebbert's pumpkin farms in Barrington and Huntley or Hampshire or wherever the other one is have them in season. I'm pretty sure there's a stand at the Green City Market (along the south side toward the middle) which fries them up fresh, although I have not tried them. BR wrote: I'm pretty sure there's a stand at the Green City Market (along the south side toward the middle) which fries them up fresh, although I have not tried them. There is, and they're pretty awesome. They are donut holes though, not whole donuts. You know, that's what everyone says, so I must just be an apple cider donut ignoramous. Those things just taste like overly sweet dough balls to me, with a browner hue than most overly sweet dough balls. Yeah, I probably like them so much because they're sweet and right out of the fryer. 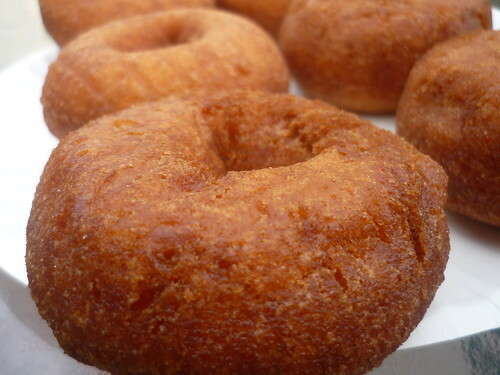 The apple cider donuts at the Apple Haus in Long Grove are a much better example of the style. Kuiper's out in Maple Park also has apple cider donuts that are quite tasty. They come either lightly glazed or with sugar and cinnamon. And as an added treat, it's close to Elburn, so you can also go to Reams' Elburn Meat Market! The GP wrote: happy-stomach mentions Glazed Donuts. Earlier this summer, I tried a six-pack of mini-donuts purchased at the farmer's market at Uncommon Ground (Devon.) We were not fans. I think one kind was sour cherry and the other was hazelnut-something. We didn't even finish them and baked goods usually have a short life in our house. Maybe her other products are better, but I'm not itching to find out. I'm actually not a fan of Glazed Donuts either. I can't even remember the varieties we tried at Green Grocer, and I only had one at Swim because I thought it was made by someone else. Glazed Donuts seem well-intentioned (high-quality, local ingredients, unique flavors), but they made me think of underbaked cake, kind of icky, actually. elakin wrote: Pucca stole my answers. D'oh! Mine too. I'm going to Long Grove on the 4th for my annual stash. However, during Apple Fest, they coat them in cinnamon sugar, and I prefer them plain like they have the rest of the year. Is that a cake donut or yeast? Their donuts are so rich it's hard to tell from the picture. Even the beloved apple fritter looks like a cake donut. Hmmm, I think I'm going to treat myself to some Old Fashioned Donut's apple fritters right after I complete my 15 mile run/walk in my training (about 2 weeks from now). Man, I think I may have to start running faster now just thinking about that fritter. pairs4life wrote: Is that a cake donut or yeast? I came to LTH and was about to post a similar request but I thought I'd put my question here, though I suspect that I already know the answer after reading through these replies. I am looking for cider donuts as well as pumpkin donuts. The cider mill back home (Uncle John's cider mill in St. Johns, MI) had the absolute best plain (unfrosted/unglazed) fried cake donuts. The two types I miss the most are apple cider and pumpkin (the also had buttermilk and powdered cinnamon sugar). Anyway, I see a lot of places listed above that have cider donuts and eventually I'll try to make it out to one. My question - do any of these places have pumpkin donuts? Ideally, I'd like to find a source in the city limits as I live in Lakeview but I realize this may require a trip into the burbs. Regarding the stand at the Green City Market with the "cider donuts" - I concur with the poster above, these are not like the cider donuts I am familiar with. The donuts at Green City are basically cinnamon donut holes, not a plain apple cider-flavored cake donut. I'm pretty sure the place you're referring to is Zullo's, run by Adriana Marzullo, who dubs these fried nubs "zeppole." These tasty pastries have been chronicled in the last photo in this Local Beet picstream and in Monica Eng's paene to this pastry . I used the excuse of needing some stuff from Ikea and made it out to the Apple Haus last week. It was also my first trip to Long Grove. What an interesting little town that is. The donuts were great and everything I wanted. Apple Fest is this wkd. I'm also glad this post brought Old Fashioned donuts back to my mind. Its a place that has been on my to go to list since I read about it on here. I somehow forgot all about it until the suggestion above reminded me of it. I also love a good apple fritter which I don't doubt they have. The cider donut looks as good as their fritters I've seen in the other threads. Thanks to all for the tips on both places. I went to Dinkel's this weekend (on Lincoln in Lakeview/Roscoe Village) and to my surprise they had "apple cider spice donuts". They were pretty much exactly what has been described here (cake donut flavored with cider) with the caveat that they have cinnamon sugar on them. I would prefer them plain but they were good nonetheless with the sugar. BigT wrote: My question - do any of these places have pumpkin donuts? Ideally, I'd like to find a source in the city limits as I live in Lakeview but I realize this may require a trip into the burbs. This week's Joe Caputo's ad had pumpkin donuts on ad for 89 cents each. I tried one yesterday. The edges are glazed. The pumpkin flavor was masked by the spices, so the pumpkin flavor was not as pronounced as I had hoped. I found a recipe for pumpkin donuts on recipezaar, so maybe I'll give it a try sometime. ...and i've had great cider AND pumpkin donuts at Country Donuts on Rt. 20 in western Elgin - they have each in glazed or sugar coated options. CD has a few other stores I think (Crystal Lake, Schaumburg). And Roll-N-Donuts on Rt. 25 in Elgin also has specialty donuts this time of year - and all their stuff is far better than most places. Also saw both cider and pumpkin donuts at Spunky Dunkers in Palatine as recently as last weekend. My favorite apple cider donuts remain those sold at the Wisconsin State Fair by the WI Apple Growers in the Wisconsin Products Pavilion. Alas, I missed the fair this year and have been unable to determine whether those specific donuts are available anywhere else the rest of the year. Searching on google yields 2 posts by me about the donuts in the top 11 search results So more info that route hasn't worked for me. Did have a close second at one of the big roadside tourist stops in Door County though. I do though, have a bag o donuts from Spunky Dunkers in Palatine right here next to me as I type this. Andrew from Gapers Block recommended them to me at the GNR dinner, and while I couldn't make it before work I still found the potential for good donuts irresistible at lunchtime. *takes a bite* Yes, this is a good donut. The apple flavor is a bit lacking though. Still very tasty, but disappointing as an apple cider donut. *chomp* Oh-ho! This pumpkin donut, on the other hand, is excellent. 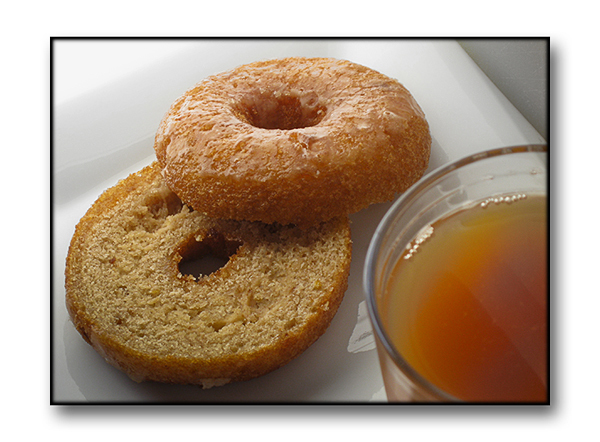 Nice cake donut, stronger pumpkin flavor, and an aftertaste redolent of pumpkin pie spices. This is a donut I'll go back for. *final bite* This chocolate cake donut is pretty good too. Not a destination donut, but something I'll almost certainly pick up again on a work day while in the area. lawoman wrote: Also saw both cider and pumpkin donuts at Spunky Dunkers in Palatine as recently as last weekend. Spunky Dunkers has two apple donuts: Apple Crisp Cake and Taffy Apple donut. I was not able to try the Taffy Apple donut since they were sold out. I liked the Apple Cider donut from Apple Haus more than the Apple Crisp Cake donut. The Pumpkin donut at Spunky Dunkers was good, but I liked the Pumpkin donut at Caputo & Son more.